The Issue Of Paternity Arises. It happens most often in scenarios where the parents are not married, and either the mother of the child is seeking child support from the father, or the father is seeking legal rights to the child. What is Paternity Under Florida Law? In legal terms, paternity is the legal establishment of parental rights of a child’s biological father. When the mother and father of a child are married, the mother’s husband is presumed to be the biological father of the child, although this may be refuted. However, when a child is born out of wedlock, the mother is the natural, legal custodian of the child, and the biological father of the child does not have legal rights until paternity has been established. Similarly, there is no legal obligation for the father of a child born out of wedlock to pay child support until paternity of the child has legally been established. Paternity of a child born out of wedlock must be legally established in order for the child’s biological father to have parental and visitation rights. Paternity cases can be very frustrating and emotional for both parties. Until paternity has been established, there is no visitation schedule or parenting plan in place that allows the father time-sharing with the child. Likewise, until paternity has been established there is no order obligating the biological father of the child to pay child support. In order for legal paternity to be established, either the mother or father of a child may initiate a paternity action. In Florida, this is done by filing a Petition to Establish Paternity. The establishment of paternity also obligates the biological father of the child to pay child support, assuming the child resides with his or her mother. A paternity action is the proper legal mechanism used by a mother seeking the father of her child to pay child support. Once paternity has been established, the court then establishes a parenting plan and visitation (now called time-sharing) schedule, along with ordering child support pursuant to Florida’s child support guidelines. The court will establish a parenting plan and visitation schedule based upon what the court believes is in the best interest of the child. The father of a child born out of wedlock may also obtain custody of a child through the legal action establishing paternity. Tampa Family & Divorce Lawyer Mindi Lasley, P.A. is an experienced Tampa Paternity Lawyer representing both mothers and fathers in the establishment of paternity cases. Contact Tampa Family & Divorce Lawyer Mindi Lasley to find out what your rights are as a parent. You may find out at a later date that a child that you thought was yours is the child of another man. Or you may be married to a woman who gets pregnant by another man. A Disestablishment of Paternity case would be necessary to release you from the parental obligation of supporting the minor child who is not yours. Cases that involve disestablishing paternity are very complex, and there are several requirements that must be met before a court will allow paternity to be disestablished. Tampa Family & Divorce Lawyer Mindi Lasley is experienced at representing both men and women in the disestablishment of paternity cases and will guide you through the legal process, zealously advocating on your behalf. Contact Mindi Lasley to schedule a consultation. How is Paternity Testing Done? Paternity testing can be done a variety of different ways. Typically in Florida, the paternity test is made by a simple cheek swab. In order to establish paternity, DNA is obtained from the alleged father and the child. 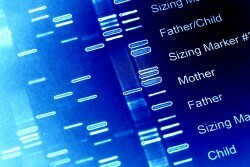 The DNA is then compared; if the alleged father and child shares enough of the same DNA, it is considered a match. DNA can be obtained from a baby during the mother’s pregnancy. Some families may choose to do this in the event that a married woman gets pregnant by another man, or simply because the family wants to know sooner rather than later. This type of paternity testing involves using a long needle carefully inserted into the mother’s belly to obtain a sample of the amniotic fluid that surrounds the baby. However, there are some risks to both mother and baby in this scenario, and it’s important to discuss those risks with a qualified obstetrician. Some individuals desire discreet paternity testing. In this case, DNA can be obtained from a non-standard sample, such as a hair taken from a hair brush or saliva from a toothbrush. This may be helpful in cases where a mother wishes to check the paternity of a child before approaching the father about his paternity status. However, since this is a non-standard method of paternity testing, it must be used with caution. With the recent advancement of paternity testing technology, DNA can be obtained from a simple cheek swab. 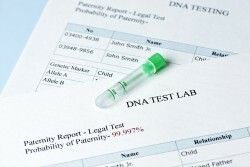 Many labs now offer the option to do paternity testing at home. They provide a simple kit with instructions on how to obtain cheek swabs from both the alleged father and the child and how to keep them sterile and send them back for testing. These tests are reliable; however, their legality may be questionable since the tests are completed at home. What Forms of Testing Are Accepted by Florida Courts? In order to legally establish paternity for the purposes of obtaining child support or visitation rights, paternity testing must be done a certain way. Typically, this involves testing by a neutral third party in a way that allows the chain of custody to be followed. For example, a non-standard DNA test, where the sample was obtained from a hair brush or some other household item, would not be accepted by a Florida court. Nor would a home paternity test where the samples were obtained without observation by a third party. This is because there is no way to know for certain that the sample that was obtained came from the father or the child. If you have completed some type of non-standard or home paternity testing and wish to pursue child support or visitation, you will need to be retested using a court approved method. Because paternity cases can often be complicated and emotionally charged, it’s a good idea to consult with an experienced Florida paternity testing lawyer. Your paternity attorney help you fill out the proper paperwork to obtain a legal action for testing and help you arrange court approved paternity testing. Tampa Family & Divorce Lawyer Mindi Lasley has worked with many families to help them establish paternity and is able to provide you with the expertise and resources needed to ensure that the process of paternity testing goes as smoothly as possible. Paternity Attorney Lasley is well-versed in Florida family law and can provide you legal support after testing in the event that you wish to pursue child support or legal rights to the child. Contact Mindi Lasley today to discuss your legal needs and to learn more about how to achieve court approved paternity results as quickly and easily as possible. Call now at (813) 873-9047.